LANCASTER—Years ago, Lancaster residents approved a bond measure for school district improvements, with a 73% approval rate. Fast forward three years, and the progress made in Lancaster ISD is evident. In the fall of 2013, stakeholders from the community, clergy, companies, campuses and classrooms united to begin the discussion about creating a shared Vision 2020 for Lancaster ISD. When considering the May 2015 Bond Election, Lancaster ISD chose to form a Bond Steering Committee as part of the planning process and it was at this time residents approved the upgrade in the Lancaster ISD facilities for upgrades and conversions. In May 2015, the bond consisted of five projects. There were two new elementary schools, both West Main and a new Pleasant Run Elementary and both opened last fall. There were also safety and security upgrades made to every campus for the 2017-2018 school year. In the coming weeks the Lancaster Elementary campus, which was converted into a new 9th Grade Center will open for the new school year. A ribbon cutting and grand opening ceremony will be held sometime in mid-August. In the Fall of 2020, there will be a new Lancaster Middle School opening. “We are really excited about the last two projects. 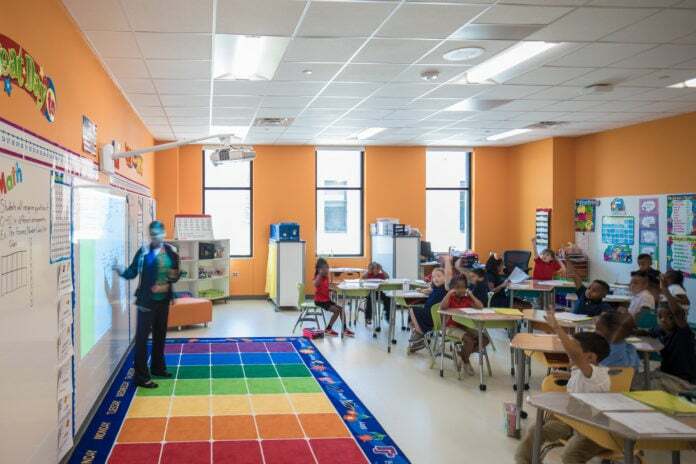 Especially since we were able to bring the first three in on time and under budget,” says Sonya Cole-Hamilton, Chief Communications Officer, Lancaster Independent School District. Cole-Hamilton said the last project will begin as soon as the construction company is selected. The deadline to accept bids has passed. Now the committee is reviewing applicants and will make a recommendation to the School Board soon. “The existing middle school campus will still be in use during the 2018-2019 school year as construction will be in progress,” she added. The new middle school will have a capacity of 1,536 students and the district is also applying new energy efficient construction, adding a tornado shelter, expanding the STEM labs, fine arts and Special Education classrooms and increasing the wi-fi range and capacity. “This approval will provide new instructional space at the elementary and middle school level to accommodate current and future growth, increases safety and security district-wide, and allows for ninth grade students to have their own campus,” Cole-Hamilton said. Overall the total bond package that passed back in 2015 was in the amount of $125,900,000. The safety and security upgrades cost $1,600,000. The new West Main Elementary School cost $24,000,000, the new Pleasant Run Elementary came in at $25,900,000 as an energy efficient facility to be built on the site of the existing campus to accommodate 836 students in grades PK3 to 5. This also includes the capabilities to support current and future classroom technology and campus security in the vestibule entry. The new Ninth Grade Center has come in at a cost of $7,400,000 and will include the complete conversion of the existing Lancaster Elementary School to become a separate campus for ninth grade students. It was determined that moving the ninth-grade students out of the high school allows the district to accommodate growth at the secondary level. The new Lancaster Middle School cost will be $67,000,000 with new energy efficient construction to replace the aging facility, utilizing the current band hall, auditorium, and gymnasium. There will also be a secure main entrance with access control and surveillance cameras, the replacement of kitchen, cafeteria, and classroom wings, the addition of a new gymnasium and paving and parking lot improvements.